One of this year’s new projects at the Invertebrate collections is NorHydro – Norwegian Marine Benthic Hydrozoa. 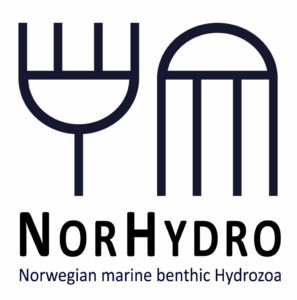 Funded by the Norwegian Biodiversity Information Centre (Artsdatabanken), NorHydro will be dedicated to the study of the ubiquitous (but commonly overlooked) marine hydrozoans of Norway. Hydrozoans are an ecologically and economically important group of animals. With approximately 3800 described species –and probably many more to be discovered– they are the most diverse group of medusozoan cnidarians in terms of number of species and life cycle strategies. Some hydrozoans live all their lives as jellyfish in the water column (thus they are holoplanktonic), but the vast majority of the species either take the form of polyps permanently connected to the sea-floor (benthic) or are meroplanktonic (i.e. possessing both a benthic polyp and pelagic jellyfish stage). Most of the time, the benthic marine hydrozoans (also called hydroids) go unnoticed by the public, but at times they can grow massively on submerged structures, causing problems for aquaculture, fisheries, and navigation, or producing huge numbers of jellyfish that in turn have a great impact on the local marine environment. Hydroids come in different sizes and shapes. Colonies living on the same substrate (like these members of Cuspidella, Sertularella, and Grammaria) do not necessarily resemble each other. 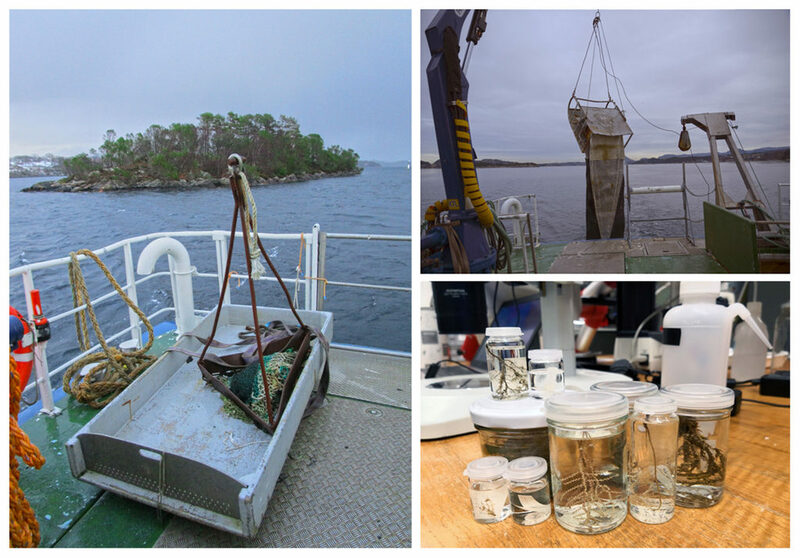 To get a better overview of which hydroid species are present in Norwegian waters, NorHydro will sample, record, chart, and DNA-barcode specimens occurring all along the Norwegian coasts. The project will rely on specimens deposited in museum collections as well as on constantly obtaining new live animals that will be identified and documented with photos before they are fixed in ethanol for DNA barcoding of CO1 and 16S sequences. Producing information on the morphology (how does it look) and the DNA sequences (the information within) of Norwegian hydroids is very important, because together these data will allow NorHydro to generate useful tools for the future identification of hydroids from all around the world. Dredges, grabs, sledges, diving and simply taking them by hand are all valid sampling methods when it comes to marine benthic hydroids. The specimens are then sorted, identified, documented with images, processed for DNA barcoding, and finally incorporated to the museum’s collection for future reference. Understanding hydroid diversity in Norway is not an easy task, but fortunately NorHydro is not alone in this quest: several partners in Norway and abroad will team up with our project, including NorBOL (the Norwegian Barcode of Life), NTNU University Museum, Norwegian Institute of Marine Research, ForBio Research School in Biosystematics, Natural History Museum of Geneva, University of the Balearic Islands, and the Institute of Oceanology of the Polish Academy of Sciences. NorHydro will also benefit from collaborations with the other four currently ongoing NBIC projects at the Invertebrate Collections of the museum (see an overiview of each of these projects here, in Norwegian), which we are sure will result in a lot of exciting discoveries in the near future. 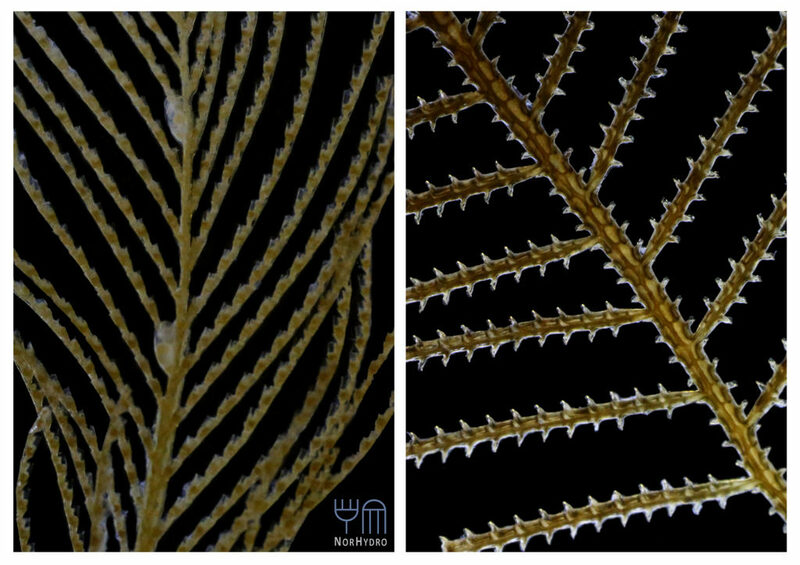 One important goal of NorHydro is to present marine hydroids to all those not familiar with these amazing creatures. In order to do that, we will regularly write entries here on the blog, as well as posting updates in Facebook and in Twitter with the hashtag #NorHydro. The official info webpage for the project is available here in English, and here in Norwegian, so don’t forget to check it out! This entry was posted in Current projects, DNA barcode, NorHydro, Norwegian Taxonomy Initiative on February 18, 2019 by katrine.